Dark matter and the so-called dark energy of our universe can be accounted for by an alternative cosmological theory. 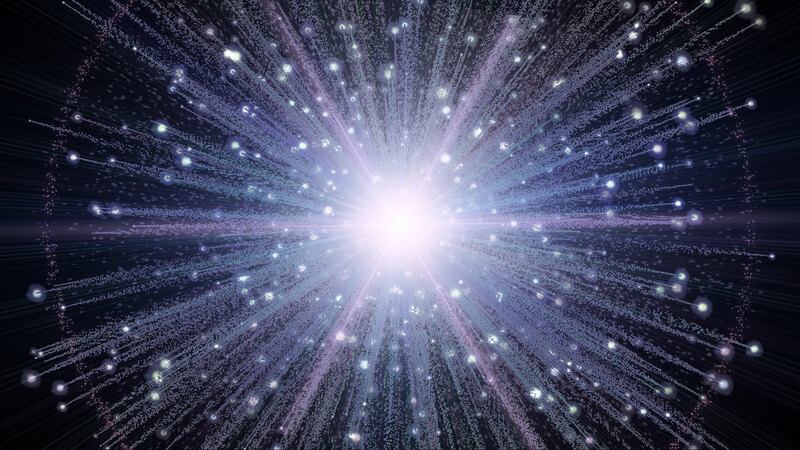 We normally think of the Big Bang as a violently expanding universe where all the mass was flung out centrifugally in a bomb-like explosion leaving essentially nothing at the center. The presence of dark energy has been proposed in this now standard cosmology since observations indicate that the universe may be expanding at an accelerating rate. An alternative theory is that the Big Bang was a violent rotational expansion of matter flung off from a rotating ultra-massive black hole at its center, with the universe in an expanding (but eventually stable) rotation around the remaining ultra-massive dark matter at the center of the universe. Under this cosmology the universe would still be expanding from the center, but decelerating centrifugally via centripetally opposing gravitational force from the ultra-massive central black hole, and then into a final average orbital radius, while maintaining fixed radial acceleration (average angular velocity squared divided by average radius) and fixed angular momentum (average angular velocity times average radius times mass). Physicists in India have proposed rotational cosmology. Dark energy however remains a theory since no one has actually observed it or an effect from it which cannot be accounted for by a better explanation. Dark energy need not be invoked in the case of rotational cosmology since the initial energy required for rotation and centrifugal expansion would be all that is necessary to explain a presently expanding (but centrifugally decelerating) universe in fixed radial (orbital) acceleration around an ultra-massive black hole – the dark matter – at its center. In addition to solving the problem of dark matter and dark energy, rotational cosmology also provides us with a picture of the universe which matches the observable rotation of planets around their stars, and the rotation of observable spiral galaxies, some or all of which orbit super-massive black holes at their centers. A review of the Doppler red (and blue) shift data from galaxies outside our Milky Way should be analyzed to see if the observed data is compliant with this new cosmological theory.